I had met Geoffrey Plaister many years ago at the Crabbet Convention of 1985, and also chatted with him at an Open Day hosted by Milla Lauquen Stud in Norfolk that same year. For the summer of 2000, it was time to visit with him at his stud. The train from London to Swindon was quick and easy once I made it through to Paddington station. It was quite a sunny day, perfect for a stud visit. Geoffrey Plaister probably has the largest collection of pure Crabbet Arabians in the entire U.K. without my taking a count. Although some of his horses are not pure Crabbets because of the use of the mare Zahri, they are 100% English, nonetheless. One only has to study individual pedigrees to see the difference. Geoffrey’s Imperial Arabian Stud uses Dargee in their pure Crabbet program. Also, Geoffrey Plaister is known as the owner of HANIF, the vibrant and famous *Silver Vanity son (now deceased). Geoffrey purchased other horses from Crabbet, including HANIF (Silver Vanity x Sirella), SILVER RANI (Hanif x Silver Grey by Royal Diamond x Silver Gilt), SIRETTA (Sherilla’s full sister) and SUNSET (Bright Shadow x Silver Gilt). After that he also purchased the mare ZAHRI (Dargee x Ziree-el-Wada by Naseel x Rose du Sable) who was bred by Mrs. Nickolson in Ireland, however, ZAHRI, is not pure Crabbet, although she is of very high percentage of Crabbet (See article in The Crabbet Influence titled Naseel: The Most Beautiful Little Horse by Alexia Ross, to learn more about Mrs. Nicholson’s breeding program). Geoffrey noted that he bought Zahri from Mr. and Mrs. Biggs and bred two foals. Then the Biggs bought her back. Four years later they gave her back to Geoffrey. After much difficulty in conceiving, ZAHRI only produced one more foal and that was the mare ZAFINAH. ZAHRI has a very interesting pedigree with some U.S. ties. These are the primary bloodlines that still exist at Imperial Arabian Stud today. I can now faithfully state that the overall quality of Geoffrey’s horses are most impressive, and will leave a lasting impression on my mind. At the stud is Diana Lodge, which is a lovely and large home that sits on 42 acres. The home was once owned by Sir Richard Blunt, a relative of Wilfrid, who for 25 years had a Thoroughbred breeding operation there. The stallion yard consists of concrete footing with Dutch door concrete walled stables. The stallion yard is enclosed on three sides and there are several larger stalls used primarily for foaling out mares. The stallions are provided separate daily turn out into a large paddock just across the road from the Lodge. The mares live in several rotated fields so they can graze and run free. Imperial Silver Star (Shabash x Zaidah) 1997 grey stallion. Georgia Cheer photo, 2001. IMPERIAL SILVER STAR (Shabash x Zaidah), a 1997 gray colt with one line to Zahri. This is a very attractive correct young stallion, with a pretty head, good height, and clean limbs and joints. His sire Shabash (Golden Silver x Silver Silk) was recently gelded, but Geoffrey has several Shabash offspring including a 2000 chestnut filly and two 2000 colts, one gray and one chestnut. IMPERIAL SHADOW (Kasadi x Sherilla), a 1990 chestnut pretty headed stallion. He has a very attractive and refined face, with pretty eyes. He also is a good bodied stallion. 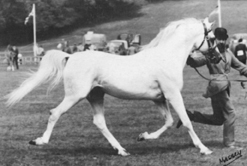 His sire Kasadi is owned by Mrs. Calvert of the long established Harwood Arabians. IMPERIAL ZAR (Spearmint x Zarifah by Hanif), a 1990 handsome chestnut by the Courthouse bred Spearmint, resembling his sire particularly in the head. He is out of Zarifah, who is out of Zahri by Dargee. ZAR has been competed in racing. Imperial Star (Nefeuret x Sadah by Hanif) 1993 chestnut stallion. Georgia Cheer photo, 2001. IMPERIAL STAR (Nefeuret x Sadah by Hanif), a pure Crabbet 1993 golden chestnut with a smooth well put together body and pretty head. Again I noticed throughout my trip that the Nefeuret (Manto x Nefeuret) get tend to have a bit more pretty in the head which could be attributed to his heavy Skowronek pedigree through his dam, Nazli. Magilla (Magic Sun x Sherilla) 1982 chestnut, pure Crabbet stallion. MAGILLA (Magic Sun by Indian Magic x Sherilla by Bright Shadow), is pure Crabbet, and is a substantial double Bright Shadow chestnut with good overall body and topline. He is a good mover, stylish, although a bit heavy in the neck. I didn’t get his foaling date (1982). His sire, Magic Sun, was a 52 mile endurance winner. INDIAN BANNER (Silvadoris x Xarifa by Indian Magic) has had an outstanding ridden show record that includes wins at the National level. 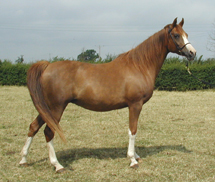 He is a 15 hands liver chestnut stallion possessing great length of neck with well balanced body. His head is a bit straight profiled but he is a handsome individual and must be lots of fun to ride. I don’t know how long he will remain at Imperial Arabian Stud but I don’t think it will be very long. All of these stallions are handsome and of good quality. Hanif (Silver Vanity x Sirella by Dargee) Pure Crabbet Arabian stallion. Christine Massey photo. A visit with Barbara and Geoffrey Plaister is like a walk down memory lane. Mounted in their hallway are photographs from the days of yesteryear, and pictures of their horses at various show grounds. Some photos are of Geoff or Barbara cuddling a foal. But of course, most of the photos are of HANIF, as are many of the award ribbons on display. Decorating Geoffrey’s office walls are plaques commorating Hanif, along with momentos from throughout Hanif’s glorious life. He is very much missed by the Plaisters, and memories shared with me by Geoff often brought a tear of happiness mixed with loss. HANIF’s show career began in 1962 (the year he was foaled) while still owned by Crabbet Park. 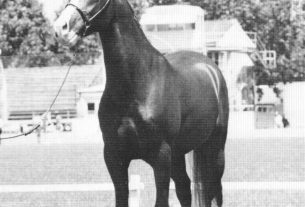 In 1962 he won Best Foal. In 1963 and 1965 he was Reserve Junior Champion. It is interesting to note that Hanif’s dam, Sirella, was undefeated in mare classes when shown and was a top class producer. Hanif has left a remarkable legacy. His offspring live on at Imperial as well as many other studs. His most famous son is HAROUN (x Indian Snowflake) who was unbeaten in his classes and was Reserve Supreme Champion three times before becoming Supreme Male Champion in 1974. Haroun was 15 years of age when he was sold by his owner Mr. Pitt-Rivers of Tollard Park Stud to Qatar in the Middle East. The most famous Imperial-bred Hanif daughter was ZARAFAH (x Zahri). As a two-year-old she was Junior Female and Supreme Female Champion at the Arab Show, winning her class again the following year. Her line is another important foundation line at Imperial Arabians. 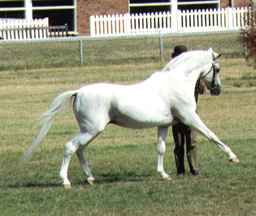 Hanif was a constant competitor in the Veteran Stallion Class shown most often by Roger Upton. As one who has witnessed Hanif on show, you would never forget his strut, and his ‘roar.’ I’ve enjoyed the priviledge of seeing Hanif on more than one occasion. I’m sure Hanif was responsible for drawing crowds to view this particular class. Hanif died in 1993 at the age of 31. Never failing to convey majestic presence every day. In living past a magic spell a wealth of joy wherein to dwell. For now he leads a life on high, a silver spirit in the sky. Imperial Starset (Kasadi x Luretta) 1992 chestnut mare. Georgia Cheer photo, 2001. What can I say about this band of mares presented before me? I have to comment that there were many mares to take notes about. However, I did not take notes, but rather just followed and listened. Most of the mares are somewhat related to one another, and on the whole, were a beautiful lot to behold. They had large expressive eyes with pretty faces. Many were 14.3 at least, with an occasional smaller mare. In fact, one smaller mare was one that I fancied and thought she would be a good riding horse for me. I saw lovely graceful bodies, with very pretty heads and necks, good toplines and legs. They all impressed me with that wonderful ‘people loving’ disposition as they walked or trotted towards us to gather around. How lovely to spend a moment or two surrounded by such beautiful and friendly Arabian mares. 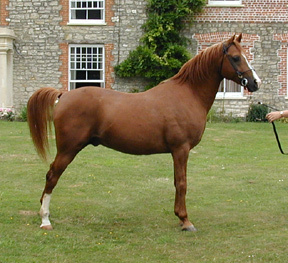 IMPERIAL LUMANA (Silver Domino x Lunifah by Ludomino) 1992 chestnut mare. IMPERIAL MISTRAL (Magilla x Sahiah by Sahara Duke) 1997 chestnut mare. Sahara Duke is not the U.S. one, he is by Crystal King x Indian Goldust. IMPERIAL NEFINAH (Nefeuret x Zafinah) 1994 gray mare, out on loan. IMPERIAL NERETTA (Silvern Sceptre x Niffah) 1993 gray mare out on loan. IMPERIAL RANI (Nefeuret x Masarah by Magnet, a Dargee son) 1994 gray mare, out on loan. 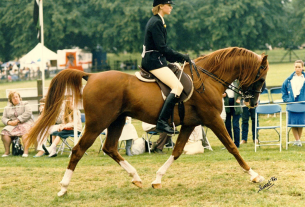 IMPERIAL RIETTA (Silver Fahd x Niffah) 1990 chestnut mare. 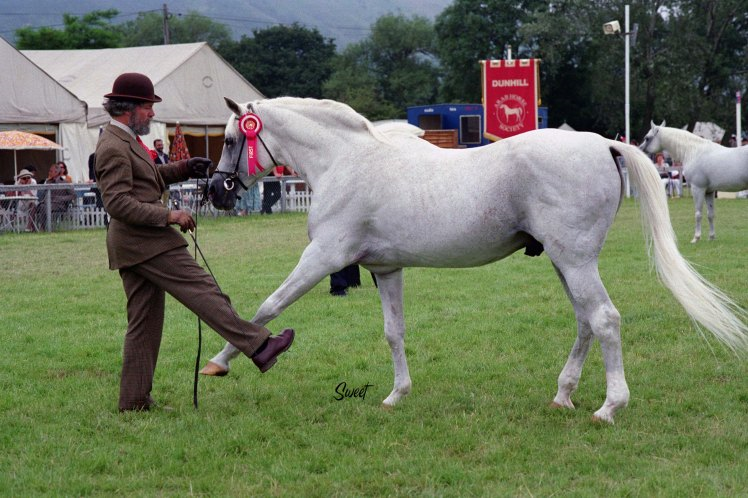 IMPERIAL SILVER SHEEN (Silver Fahd x Zafinah) 1991 liver chestnut mare. IMPERIAL SILVER SUNSET (Silvern Glimmer by Bright Crown x Mur Es Sams) 1991 gray mare. IMPERIAL SIRELLA (Nefeuret x Sadah) 1992 chestnut mare. IMPERIAL SUNGOLD (Silver Fahd x Sunset Gold) 1990 chestnut mare out on loan. 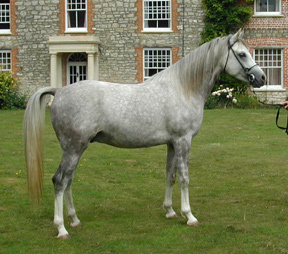 IMPERIAL ZARA (Nefeuret x Zaidah) 1995 gray mare. IMPERIAL ZARAFAH (Nefeuret x Zarafah) 1995 gray mare. 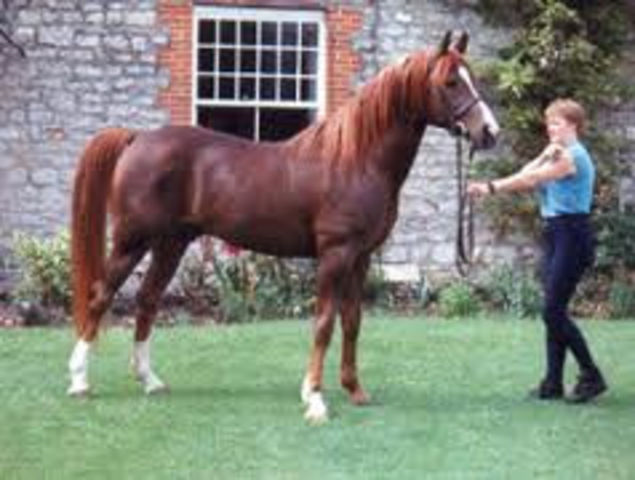 IMPERIAL ZAREE (Nefeuret x Zaidah) 1992 chestnut mare. IMPERIAL ZAFINAH (Silver Fahd by Achim x Zafinah by Hanif) 1990 gray mare. LUNIFAH (Ludomino x Hanifah) 1986 chestnut mare. 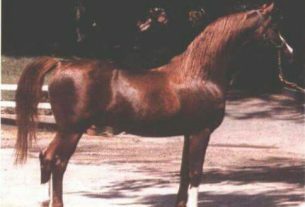 LUDRETTA (Ludomino x Marufah) 1987 liver chestnut mare. MAGIC HEART (Magic Sun x Sheriyah by Hanif) 1985 gray mare, with Shabash April 23, 2000 gray colt at her side. MALIHAH (Hanif x Maleka by Indian Magic) 1975 chestnut mare, with Shabash April 10, 2000 chestnut colt at her side. MUR ES SAMS (Hanif x Sunset) chestnut mare, no foaling date given, has a Shabash April 29, 2000 chestnut filly at her side. NIFFAH (Hanif x Marufah by Manto) gray mare, no foaling date given. SAHIAH (Sahara Duke x Malihah by Hanif) chestnut mare, no foaling date given. SANIFAH (Sahara Duke x Hanifah by Hanif) 1985 gray mare. SUNSET GOLD (Sir Star x Mur Es Sams) 1985 chestnut mare out on loan. ZAFINAH (Hanif x Zahri by Dargee) 1985 gray mare. ZAIDAH (Sir Star x Zarafah by Hanif) 1987 gray mare. ZARINAH (Ludomino x Zarafah by Hanif) 1988 gray mare. My experience as a guest of Barbara and Geoffrey Plaister was wonderful. Their hospitality and sincere love of their animals shows in every square foot in their home and in our discussions. I found myself wandering into the mare fields on my own just as one might find themselves sneaking another helping of a favorite dessert – the pleasure of these Crabbet mares was just that appetizing. When you have a chance to visit England you must schedule Imperial Arabian Stud as a must see. For more information about Hanif and Sirella please refer to the article written by Emma Bennett in Collectors Volume II, page 62 and 63 (coming to the website soon).